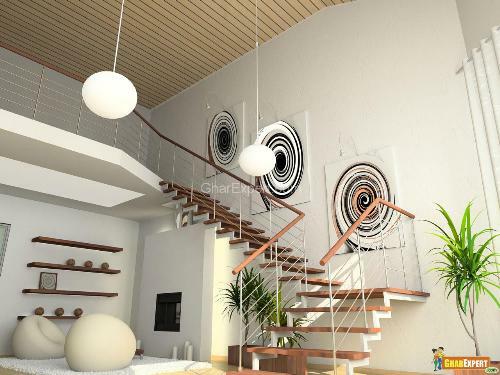 While designing stairs the house owner should consider every design requirement of the stairs since well designed stairs provide easy access to upper floors of the house. The steps of stairs may be constructed as a series of horizontal treads. The tread is horizontal width of stairs step whereas the enclosed space between treads is known as riser. The part of building having stairs is known as staircase. This article tells you about necessary design requirements to be kept in mind while designing stairs. You can design comfy stairways concerning average human height. During design process many things such as dimensions of an average person, average comfortable walking stride; fixing gradient or pitch of stairs, height of hand rail and minimum head room should be considered. 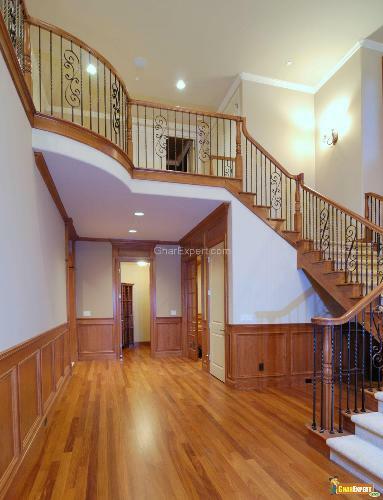 A well designed stair has easy access and proportions of treads and risers should be more than twice the rise. Various stair layouts from straight flight to a number of intricate curves and landings have similar basic principle of stair design. The stairs should be comfortable to walk on not only for the young but also for the old. People usually prefer to the straight stairways for easy access to upwards and downwards. The most commonly used materials in construction of stairs are - stone, timber, steel and RCC. 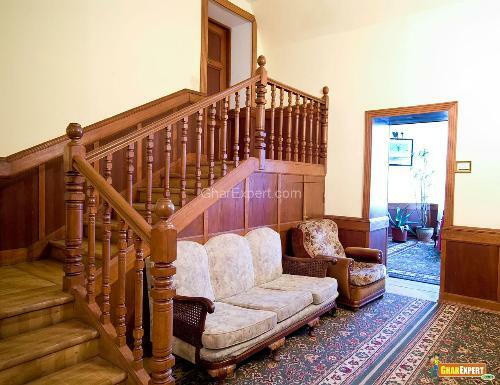 Minimum width of stairs for single family house should be 75 cm and if the number of users is more than 10, minimum width of stairs should be 95 cm whereas minimum width of stairs for two or more family houses should be 100 cm and if the number of users is more than 10, minimum width of stairs should be 125 cm. Minimum width of stairs for hotels, offices, educational buildings, theaters, cinema halls should be 1.5 meters while minimum width of stairs for institutional buildings and hospitals etc. should be 2 meters. Note: The width of landing should be more or at least equal to the length of steps. It is preferable to provide two or more staircases where the number of users exceeds 300. Minimum width of a tread for residential building should be 250 mm. In special case due to non availability of space, the minimum width of tread for residential building and small commercial units should be 200 mm. Minimum width of a tread for non residential building should be 300 mm. Maximum height of riser for residential building should be 190 to 200 mm whereas maximum height of riser for non residential building should be 150 to 170 mm. Riser: it is the height of a stair step. Minimum slope of stairs with floor should be 26 degrees whereas maximum slope of stairs with floor should be 45 degrees. Ideal slope of stairs with floor should be 30 degrees. Hand Railing should be made at stairs for comfort while going up and down the stairs. The height of handrail should not be less than 800 mm and more than 900 mm. Minimum clear head room or the height of roof from any step of stairs should be 2.1 to 2.2 meter for easy movement of large furniture. It is also useful for movement of other household items. The stairs should be well lighted with two ways electric switches provided at top and foot of stairs. Keep same length, width and height of steps of stairs otherwise it would lead to accidents. Install a gate at the top or bottom of stairs for safety and security reasons. Don’t keep more than 250 mm space between supports of handrail in houses to avoid any accidental fall especially for kids. Keep maximum height of one flight not be more than 2.4 meters. Construct maximum number of steps in one flight not more than 15 and provide landing after 15 steps for comfort while moving up and down the stairs. Provide nosing on treads while laying flooring to enhance the width of tread. Design stairs in such a way as the riser makes obtuse angle with tread to enhance the width of tread. Don’t make the floor of steps slippery. Make grooves in case of cement concrete floor to avoid slippage. Make provisions of getting natural light and ventilation while designing stairs.